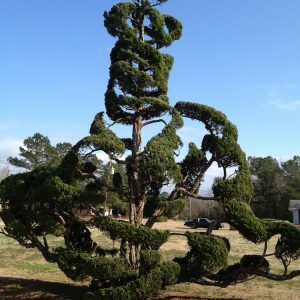 Two acres of meticulously sculpted plants include graceful arches, spirals, geometrics, abstract shapes and fantasies — all the work of internationally recognized S.C. topiary artist Pearl Fryar. The garden has been featured on local and national television shows and in several international publications. In 2006, the award-winning documentary A Man Named Pearl was released. Today, visitors from around the world come to see Pearl’s beautiful and fascinating horticultural sculpture garden. Park across the street and stroll the outdoor garden at your leisure. If Pearl is in the garden, he is happy to say hello. Please call ahead to schedule group tours.